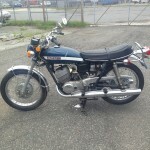 1971 Suzuki T250 Hustler SOLD! 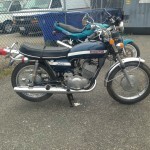 Way back when …The Hustler was one of the bikes that put Suzuki on the map in the early Seventies —­ perhaps more than any other model. Its capable big brother (the T500 twin) had been around for two years when the T250 was launched in 1969, but the bigger two-stroke never quite captured the imagination of a motorcycling public that preferred four-stroke engines when it came to larger road bikes. 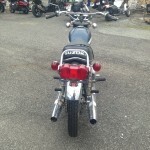 On the other hand, most riders regarded two-stroke engines as a perfectly acceptable way of obtaining high performance from a smaller package, and the T250’s predecessor, the T20 X6 Hustler, had already established a sound reputation in that regard. Launched in 1966, the 247cc two-cylinder T20 was light and quick (good for over 90mph, it was even raced successfully), and its six-speed transmission was a first for a production machine. But the T20 was very much a bike of the 1960s, with dated features that included a chromed gas tank with rubber knee pads and an optional, accessory tire pump that clipped to the frame in bicycle fashion. Carbs, gas tank and petcock have all been cleaned and reassembled. It’s got a new battery and the keys are getting cut this week. 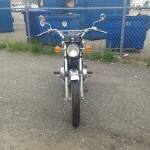 With that said – she’s running and ready to go – so the price is now $1500. Come take a peek today. 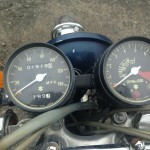 She’s in great shape for her age with little rust and screams with vintage Japanese moto-style.